For more than ten years, the Borexino Detector located 1,400 meters below surface of the Italian Gran Sasso massif has been exploring the interior of our Sun. During this time, the project has provided amazing insights into how the star at the center of our solar system generates its energy. 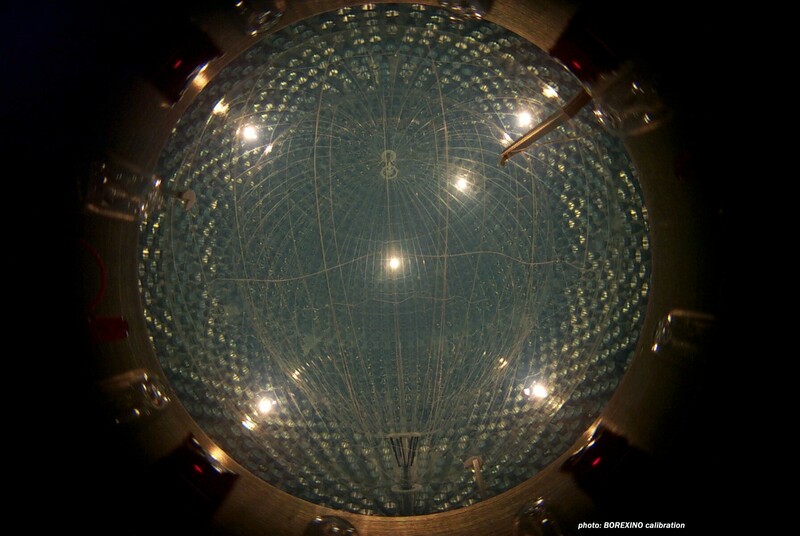 The scientists involved, including physicists from Johannes Gutenberg University Mainz (JGU), have now published a general analysis of the data they have collated on solar neutrinos. Neutrinos can penetrate all matter almost without leaving a trace and are thus difficult to detect. As a result, they have become known as 'ghost particles'. They originate from a variety of sources, ranging from radioactive decay to astronomical objects and, in the case of solar neutrinos, from the Sun. The current paper in Nature not only describes the results of measurement of the solar neutrino spectrum but also uses this to deduce details about processes at the Sun's core, giving us an insight into the mechanism that has kept our Sun shining for billions of years. The Borexino experiment is running at the Gran Sasso subterranean laboratory, which is maintained by the Italian National Institute for Nuclear Physics (INFN). Deep below the Earth's surface, the experimental facilities are well-shielded from cosmic rays. Thus, the experiment is able to detect the weak signal produced by solar neutrinos. Borexino was originally conceived 30 years ago and began recording data in 2007. This extensive collaborative project involves institutes from Italy, Germany, France, Poland, the USA, and Russia. The project's scientific success is primarily due to the outstanding radiopurity of the experiment. At the innermost core of the facility only infinitesimal amounts of natural radioactivity are present, i.e., only one trillion times fewer atoms per gram of the elements uranium and thorium than in the surrounding rock. This extraordinary purity is crucial for precisely measuring the energy spectrum of solar neutrinos. It makes it possible to determine the rates of the fusion processes taking place inside the Sun, which are highly dependent on the temperature and elemental composition of the Sun's core. Alongside this glimpse into the conditions deep within our star, the results also provide detailed insights into the oscillation process the neutrinos undergo inside the Sun. Oscillations describe the transformation of the three different types of neutrinos into each other, a process that was only conclusively confirmed for solar neutrinos in 2001. "Borexino’s findings far exceed the most optimistic predictions we made when we first started," said Gianpaolo Bellini, one of the pioneers of the INFN experiment. Professor Michael Wurm, a physicist at JGU and a Borexino partner, affirmed this: "The new results generated by Borexino impressively confirm our current understanding of fusion processes inside the Sun. Our measurements of the complete neutrino spectrum clearly demonstrate the effect solar matter has on the oscillations of the neutrinos produced at the Sun's center." While, at the lower end of the spectrum, neutrinos leave the Sun unaltered, at the upper end of the spectrum, the effect of the oscillations is intensified.